Home Fitness & Wellness What Are the Benefits of 30 Minutes of Cardio a Day? As a long day work ends, do you get home exhausted, climb onto the couch, and watch TV for hours? Chances are that you hurriedly go to work the following morning, and the cycle continues. But you could use a little of this time to make positive changes in your life. 30 minutes of cardio per day may sound insignificant when looked at as a one day thing. But keep at it day after day and you will achieve better health, fitness and a more fulfilling life. Regular cardio exercises improve the health of your heart and circulatory system in general. Exercise causes your heart to beat faster in order to supply blood to your muscles, including those of your heart. The increased blood flow supplies more nutrients and oxygen to the heart muscles, making them healthier and stronger. Physical activity also helps improve blood pressure and cholesterol levels. 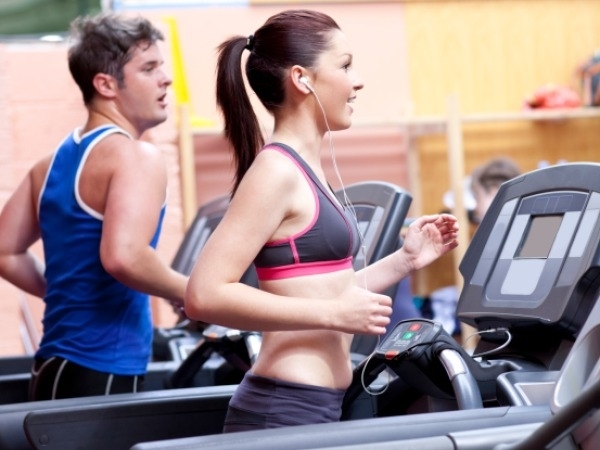 You may experience shortness of breath and burning lungs when you start doing cardio. But as you keep following a daily cardio routine, it gets easier on your lungs and soon their efficiency improves and your muscles and other tissues can receive adequate oxygen with minimal breathing stress. You will not easily get winded when you run upstairs or lift heavy objects. Do you dream of becoming an athlete? It doesn’t have to be professional. 30 minutes of cardio a day can help you work towards this goal. Doing cardio regularly helps build stronger muscles and improve your circulation and breathing. This combination causes your body to work more efficiently so that you are faster and able to endure physical exertion for longer. You will soon find out that you can walk, run or swim for more time without running out of breath or feeling tired. Research has shown that exercise helps people with insomnia to sleep better. But even for non-insomniacs, exercise will improve the quality of sleep. Regular cardio prepares the body for rest at the end of the day. It also reduces the tendency to feel sleepy during the day. Studies have also found that exercising regularly reduces the occurrence of leg cramps in your sleep. For better results in sleep improvement, exercise in the morning instead of evening. Some studies indicate that evening exercises can cause some people to remain awake for longer. If stresses of work make you moody or depressed, why not try some cardio workouts? Exercise helps to lift your mood by activating your body to produce relaxing hormones such as endorphins and serotonins. Outdoor exercises such as walking and running also expose you to relaxing and interesting scenery besides providing you with fresh air. If you exercise with friends, the positive effects increase. Starting a cardio routine demands your will power. Sustaining it through weeks and months is a sign of self-discipline and the ultimate result is self-confidence. While sticking to the regular workouts will help you develop self-discipline and confidence in your ability to exercise, you will find that these qualities will permeate other areas of your life. It could in fact lead to a promotion at work or help you win the love of your life. Is 30 Minutes of Cardio per Day Enough? Yes, it's enough. The Center of Disease Control and Prevention recommends adults to do 150 minutes of cardio every week. So 30 minutes of cardio every day can help you meet the guideline. What Counts As Cardio Activities? Provided you have the commitment to put in 30 minutes of exercise, there are many activities to choose from. You can cycle, swim, dance, jog, walk or jump the rope among other exercises. If you would rather go to the gym, working out at treadmills, rowing machines, exercise bikes, elliptical trainers, etc. will suffice. And if you can get into basketball, tennis or such other sports, you can easily do your regular 30 minutes of cardio every day and make your body and heart stronger. A lot of people get into cardio to shed some weight. And yes, you can use cardio to lose weight. To achieve this, you may need to put in more time. Do not go beyond 45 minutes per session, however, because this may increase your body’s production of the stress hormone known as cortisol. High cortisol levels will defeat your weight loss purpose by causing an increase in body fat deposits. Here are three 30-minute cardio plans to help achieve your weight loss goal. Begin with zero incline and cycle at a speed just beyond your walking or jogging pace. After 2 minutes, increase the incline by 4 percent every 60 seconds. In another 2 minutes, reduce incline by 2 percent per minute. The next 3 minutes, jog/walk at a gentle pace. Repeat whole cycle for at least 30 minutes. Use an online calorie calculator to calculate how many calories you burn. Set manual program for a 30-minute workout and pick resistance level slightly beyond your normal physical activity. After 6 minutes, raise the resistance to force you to exercise harder. 2 minutes later, push resistance higher at 30-second increments. 2 minutes later, decrease the resistance so that you exercise more comfortably. 6 minutes later, change settings and resistance to moderate and work backwards. Repeat the routine for 30 minutes. Use an online calculator to find out how many calories you burn. Set manual program for a 30-minute workout and a resistance slightly beyond your ordinary physical exertion. Cycle moderately for 5 minutes. In the next 2 minutes, increase resistance 2 or 3 units at 30-second intervals. In the next 2 minutes, decrease resistance 2 or 3 units at 30-second intervals. For another 1 minute, increase resistance considerably and pedal harder and faster. Repeat the routine to realize your 30 minutes of cardio a day. Use an online calorie calculator to find out how many calories you burn.